Luke Skywalker should count himself lucky – his dad only wanted to rule the universe. When Peter Quill aka Star Lord (Chris Pratt) finally catches up with his old man, Ego (Kurt Russell), in this sequel to 2014’s ‘Guardians of the Galaxy’, he’s up to a whole lot worse. 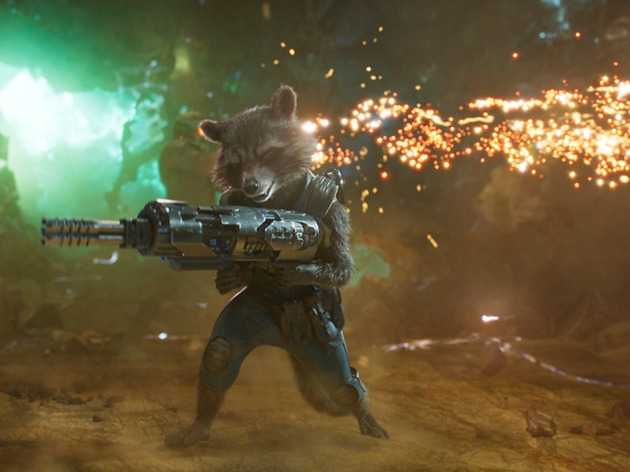 We find our heroes up to their necks in trouble after Rocket the Raccoon (Bradley Cooper) steals a satchel-full of alien batteries from a warlike, golden-skinned Priestess. Gamora (Zoe Saldana) has been reunited with her evil-ish sister Nebula (Karen Gillan); Groot (Vin Diesel) is still an adorable baby tree; and Drax (Dave Bautista) is still flummoxed by everything. When Ego shows up, he seems like a saviour – but in space, fathers always have secrets. After the sugar rush of the first film, recapturing the magic was always going to be an uphill battle. But for all its wit, speed and wacky cameos (Howard the Duck! Sylvester Stallone!) this second instalment still feels like a disappointment. Until well past half way through, it doesn’t even have a plot, just a bunch of amusing scenes strung together. And when the story does arrive, it’s fairly half-arsed: big villain, universe in danger, loads of explosions. The characters are still fun to be around, the one-liners are still sharp (‘My turds are famously huge!’) and the soundtrack is, of course, terrific. But there are only so many times you can slap on a Fleetwood Mac toe-tapper and expect it to paper over the cracks. Maybe I'm just getting old but I find these movies just a bit silly really. Definitely one for the kids with jokes about poo and bums, and an animated raccoon-type thing that insists it's not actually an animal! Chris Pratt is likeable as always and Zoe Saldana is green and feisty, with Kurt Russell guest starring as a powerful god-like being that creates worlds. The opening sequence as Baby Groot dances around to Mr Blue Sky while his team-mates battle a big tentacle thing is fun but ultimately this movie lacks and kind of substance. It's just like watching some kind of big video game most of the way through with two dimensional characters. Basically one long pop video. Not bad..... Not as great as the first in my opinion .. It was light hearted yet humorous most of the time. Guardians of the Galaxy Vol. 2 is a fun, witty romp through space. I have rarely had such fun in the cinema, and it kept me interested from beginning to end. Others have suggested that the plot is rather non-existent, but I found it quite gripping. Yes, there were some moments where it felt disjointed, but overall I was hooked by the humour, drama, action and emotion. The performances are strong, with Dave Bautista really shining as Drax (though he does have the best of the script). It may not be everyone's cup of tea, but if you liked the first one, there's very little to find fault with here. This sort of silly, entertaining and yet life affirming film is surely what the world needs more of right now. The first film was excellent, I was expecting a lot here and the marketing hype wasn't helping; sadly it simply disappointed. The music was so, so and the plot was original but lacked substance. Love the characters but they kept them stuck in one place for too long. They need to be running around the galaxy saving stuff! I must admit, when the first one came out, I wasn't really feeling going to the cinema to go see it, my husband, thankfully persuaded me otherwise. I adored the soundtrack, the plot, everything! I basically ran to the cinema when this one came out! Already having the Awesome Mix 2, I was ready for the music and when the film opened on that scene, I knew my excitement was rightly justified! What is it as good as the first one? Probably not, but look, I am a sucker for an adventure in the stars, especially when it includes over 900 jumps (That scene was FANTASTIC) and it is the perfect way leave earth and all the problems on it for a couple of hours! What can I say? It was funny, entertaining, and I loved the soundtrack. The plot was... well, it's a superhero movie, right, but I didn't expect so much of it to revolve around some batteries and revenge... the arc about Star Lord and his father was interesting but I think it was just too drawn out to be worth staking a film on, and it just became more and more implausible as the film went on. All in all, worth seeing, sure, but I'm glad I only paid half price for my ticket for a few hours of mindless entertainment. Fun and entertaining! Some beautiful scenes with lots of cool visual effects. Mediocre acting and story line, but with some great one-liners. Go watch it, especially if you're a Marvel fan! I thought this was a nice follow up to the original. Amazing soundtrack, loved baby grut, and there was actually an interesting storyline (for marvel) rather than just another repeat of the same. If you like chris pratt - go watch this! I'm not the biggest fan of the marvel films but I got convinced to go and see this with my partner. The storyline wasn't the strongest but luckily, the film had an awesome soundtrack to make up for it. The talking racoon still reminds me of that episode of THE Apprentice where the candidates created a space travelling badger... pure stupidity. This film escapes the general sequel fate by acting being on par if not better (YES BETTER) than the first one. The soundtrack rivals the first, and it has even more funny come-backs than before. Well worth a watch, even if you're not a Marvel fan. This is the perfect non-superhero superhero film! Kicking soundtrack? Check. Hilarious comedic one-liners and sequences? Check. Great, blasting action moments that are awesome and also just a bit ridiculous? Check. Sisterly love and female awesome-ness? Yas. And an adorable baby groot that after watching you wish was actually real so you could have one of your own? OMG YAS. Guardians of the Galaxy Vol 2. really avoids the "not as good as the original" that befalls so many sequels. It has it's moments of uber cheesiness, and some of the action sequences are amazingly over-the-top, but they're easily looked over given the flow of the story and the originality of the plot. 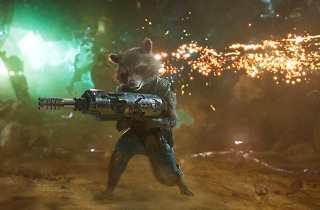 Guardians is one of the few superhero films I've seen that is working hard to avoid the same plot-lines and story arc. It really delves into the characters and why they act the way they do, which was refreshing. The comedy is what made this film so enjoyable. Timings were down to a point. Well, the comedy and Baby Groot. And the soundtrack. Okay, many things made this film enjoyable. You will not be disappointed, go have a fun time at the cinema! How do you improve on utter brilliance? No idea. But, after watching GOTG2 writer-director James Gunn may just be the person to ask. The film defeats difficult second album syndrome with ease by drop-kicking it with high-octane action sequences, hilarity of many different kinds and Baby Groot. If you loved the first film then you'll already feel a degree of attachment to Baby Groot. By the end of the opening sequence it'll be true love of the cutest order. Great film, and I love that these films are using just enough humour to keep newly converted comic book film fans interested (ie me). I went into Guardians with fairly low expectations, as I loved the first one so much. However, I needn't have worried. Guardians of the Galaxy Vol. 2 develops the stories of the core characters, and provides plenty of laughs. There have been some criticisms about the lack of giant boss battle, but I found that I really didn't care: I was invested in the characters, so I enjoyed the film a lot. If you loved the first film, then definitely check this out. In my opinion, this must be the film of the 2017. I am biased in the fact I loved the first movie, and have a bit of a crush on Chris Pratt. However, I feel like they smashed it with the sequel in every way possible. It’s funny, action packed, and the story line follows on perfectly from the last chapter.You can watch this without watching the first chapter but I wouldn't recommend it, it's just so much more funnier when you know the back story. I absolutely loved this. After the first film I worried that it'd come across as a tired reboot, but they've managed to still make it funny and fresh, and while not outshining the first it is a solid addition - can't wait for the third! I think that rather controversially I actually preferred this sequel to the original movie. Don't get me wrong I really enjoyed the first movie, it was ace but this one was even more fun in my opinion. The characters gel together really well and seeing them all interact was more enjoyable than following the storyline to find out what would happen next. The soundtrack is good but I think the music in the first was a lot better. Overall I think the characters hold this film together but I also really liked the fatherhood story. The concept that has been covered many times of 'I may not be your biological father but I'm proud to say I am your dad' is always beautiful and to my surprise I almost got emotional at that scene in the film. I'm a fan of this film series! I thought the first one was really good and the second one lives up to the first one. It's cheesy but it's a big box office film, what do you expect? If you've seen the first Guardians of the Galaxy, you know that it is not the typical super hero film but for me the first one is actually the best one ever. So as you can expect I was very keen to see volume two. It is a very entertaining, funny and action packed film BUUUT sometimes it goes a bit too far and becomes way too cheesy. Regardless I really enjoyed it and would recommend it to all the geeky friends and super heroes fans out there. Guardians of the Galaxy 2, in my humble opinion, completely lives up to its first installment, if not surpasses it. Certainly, by giving Drax an increased amount of screen time, it comes close. I very much enjoyed the fact that we were less focused on the supervillain and much more on characters and everyday lives. Everyone gets more time on screen and I felt like I got a chance to get to know each of the team members individually. That takes skill, especially when the first Guardians was so well constructed. Saying that, I believe the sequel surpasses the first in its original approach to the story. The plot (spolier alert) of Peter's dad and his murderous, evil plans are really just there to have a reason to make a film - otherwise it's character development that carries that film, with insanely good humour and atmosphere. I already thought, based on the first film, that Guardians is one of the most entertaining and original Marvel storylines put on screen - even though it sounded like it'll be just a weak attempt at first - and this sequel just goes to show. Every character is well acted, the story stands on its two feet but doesn't become tiresome and well, the music is... awesome. Anyone who dares say they didn't instantly look up the soundtrack on Spotify as they were leaving the cinema is lying. I'm very hard on comedies - it takes a lot to make me laugh properly (only the likes of Wayne's World are capable), but Guardians is going on that list! This is a really fun movie, with a good storyline and some really amusing moments. Baby Groot steals the movie and makes the opening credits so adorable. Drax’s comments to Mantis are often hilarious too. There are a few threads to the plot, where the main story seems to break into two – Rocket’s capture and bonding with Yondu and Quill learning more about his father and his mysterious planet. All this happens whilst Gamora learns more about her relationship with Nebula. I love it when characters aren’t always straightforward good and bad. As expected there’s loads of action (bit cartoony in places due to the CGI) but this seems to fit the comic book style it’s adopting. As before references to the 80’s especially regarding Knight Rider was fun. This is a fun movie with a non-taxing plotline. How on earth do you review a film like this. It is utterly preposterous, juvenile and nonsensical. At the same time it is hilarious and gripping. I had only the vaguest memory of the first one and while visiting friends and collectively having 6 children of various ages this is what we opted for. There are moments where I was disgusted and moments where I was rolling on the floor laughing. I can't say the ' emotional' bits really touched me. If you liked the first one, or simply like a good bit of rip roaring, space based alien fun you'll love this. I was thoroughly entertained throughout and am glad I went to see it.! I already loved the first volume but Guardians of the Galaxy vol. 2 is absolutely hilarious! Even though this movie is a lot more based on emotions and love / family stories, there's a tone of great jokes and (as usual) some amazing songs! This movie is perfect if you need to watch something relaxed, not too complicated and fun! Tips: if you're going to the cinema to watch it, make sure you stay until the end!